Christmas is a time to indulge both ourselves and our guests. If you’re on a budget and want to serve one special treat at your Christmas gathering, shrimp fills the bill. There’s nothing wrong with a classic cocktail sauce, but offering an option livens up the party. Feel free to buy peeled, cooked shrimp if you’re short on time. Whisk together all the ingredients in a bowl. Cover with plastic wrap and refrigerate for at least 6 hours for the flavors to develop. * Chili sauce is a spicy tomato-based sauce that can be found in bottles right next to the ketchup. Stir together all the ingredients, starting with 1 tablespoon of the wasabi, in a small bowl. Cover with plastic wrap and refrigerate for at least 6 hours for the flavors to develop. Taste and add more wasabi, if desired. Fill a large stock pot with 12 cups water, the bay leaf, and the peppercorns. Cover and bring to a boil over high heat. Add the shrimp, cover the pot, and bring back to a boil, stirring the shrimp up from the bottom once or twice so that they cook evenly. Boil the shrimp until they just begin to turn pink, for about 2 minutes. Keep covered, turn off the heat, and let sit a few more minutes until the shrimp are cooked through. Drain in a colander and immediately place shrimp in an ice bath to stop further cooking and prevent tough shrimp. Peel and devein the shrimp. You may refrigerate them in an airtight container overnight. Leave the last segment and the tail intact; this gives guests something to hold onto to. 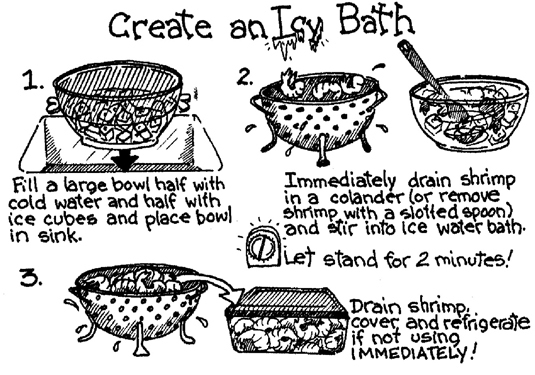 To serve, arrange the shrimp in a bowl set in a larger bowl filled with ice. Offer the Cocktail Sauce and Creamy Wasabi Dip in separate bowls, along with lots of paper napkins.